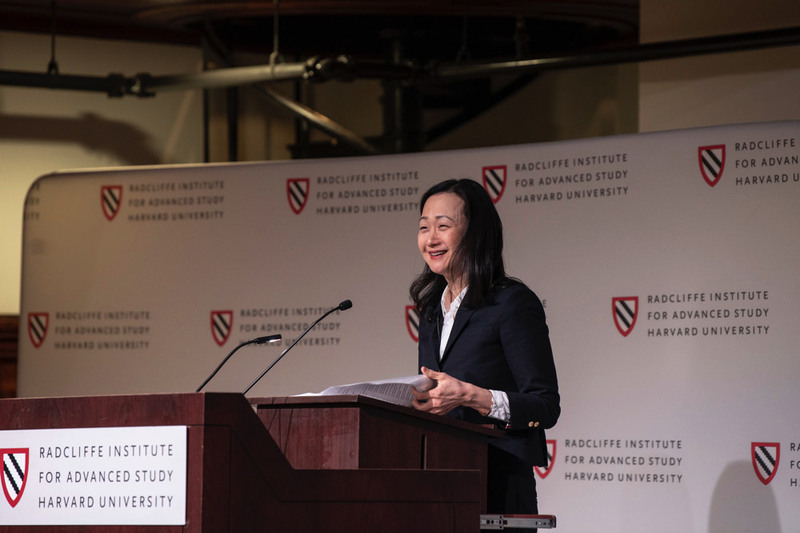 Author Min Jin Lee, a fellow this year at the Radcliffe Institute, is best known for her epic novel Pachinko (2017). The story follows a Korean family from the nineteenth century through the 1980s, spanning Japan’s annexation of Korea, the central character Sunja’s migration to Japan and survival of World War II, and Japan’s rise as a wealthy consumer society. For many Americans, the novel was their first introduction to life in Korea under Japanese rule and to the social identity of Koreans in Japan, many of whom could not become Japanese citizens even after their families had lived there for generations. The title of the lecture she gave at Radcliffe yesterday evening, “Are Koreans Human? Our Survival Powers, the Quest for Superpowers, and the Problem of Invulnerability,” comes from a question she had been asked by a European journalist: “What are Koreans like?” Throughout the talk, and the discussion that followed with law professor Jeannie Suk Gersen, Lee considered what it means to ask that question, and how, through fiction, she combines glimpses of an answer. The talk was this year’s Julia S. Phelps Annual Lecture in the Arts and Humanities, a distinguished speaker series held by Radcliffe (last year’s was given by novelist and Radcliffe fellow Marilynne Robinson). Lee is not an expert on Korea, and her Korean, she says, is not very good (her family immigrated to Queens from Seoul when she was seven). But her writing and speaking reflect her distinct ability to communicate the vulnerable, the intimate, and the unexpected in her subjects from across the Korean diaspora. At Radcliffe, she is working on the third novel of her “Koreans trilogy” (her first book, Free Food for Millionaires, is about an ordinary young Korean American trying to make it in New York City). “To complete my trilogy of the diaspora,” Lee explained, “I wanted to know, what is the most important value of Koreans, not just in Korea, but around the world? And I sensed what it was: Koreans value education. They value it like nothing else.…Koreans have regarded education as a gateway and a path to progress, distinction, and proof of one’s value.” The flip side of this is that competition for spots in Korea’s top universities, Seoul National, Korea University, and Yonsei University (SKY), is fierce, and SKY graduates dominate the country’s top companies and public offices. Lee conducts an immense amount of research and original fieldwork for her novels; much like any American, she did not know that much about hagwon culture before investigating it. She wanted to understand how these values have shaped modern Korea (its “incredible superhuman economic success,” she says, mocking newspaper clichés), and how its national history, its emergence from Japanese colonialism and catastrophic postwar poverty, have shaped its culture in turn. She has traveled to Seoul, as well as London, Los Angeles, and New York, and will soon head to Australia and New Zealand, to meet with hagwon students, parents, and teachers. She has met students who study dawn to dusk in windowless rooms, as well as students who play hooky, and teachers who let them, because they know that they need a break. Lee has interviewed elite university presidents, and last October attended the Harvard admissions trial. “Doing this kind of work as I write and rewrite a work of fiction humbles me,” Lee explained. “It teaches me—reality corrects my preconceptions. And my eyes and my ears experience what my characters may ultimately feel. However, I’ve noticed that every single Korean I’ve spoken with has specific wishes and reasons. I worry a great deal about how Koreans are perceived, not because I think Koreans are ideal...but because I find that Koreans don’t get to tell their full story.…Why do Koreans care so much about education? One reason is that Koreans want power. No less than any of us in this room. Koreans want power because the average Korean, whether she lives in Busan or Toronto, may feel less than powerful. And who among us would deny that we sometimes feel less than powerful and that sometimes life can feel like a dead end? So I asked myself, what will a mother do when she wants her child to have a little more than she has? And how is she different from me, and how is she different from us? I am overwhelmed by the complexity of my subject—and because I realize that I am not writing about education, the diaspora, or Koreans, I’m writing about humans, and we are very complicated, we are vulnerable, we are needy, and we are frightened. We make terrible choices and we live with regrets. And more often than not, we cannot give voice to our most important feelings. Later, during her discussion with Jeannie Suk Gersen (who cautiously admitted: “I attended hagwon”), Lee responded to a question about how she squares the harshness of the hagwons with her sympathy for the social purpose they fill: “The more I study [hagwons], the more I like them…and I’ve realized it’s not just for studying. It’s actually almost like a community center; it serves a daycare function.…I realized that these are very human institutions.” And: “If you enjoy football, you are witnessing the destruction of young men. Every time I watch a football game I think, as a parent, how can we do this to children?” Americans’ assumptions about hagwons, she suggested, should invite us to think more deeply about what we think is OK, and why. “I’ve been asked why I write about Koreans,” Lee said. “And it seems like such a strange question. Because why wouldn’t I write about Koreans? To me, Koreans are mothers and fathers and daughters and sons, which means Koreans are like us; we are worthy of consideration and reflection. “So, what are Koreans like?” she continued. “I talked about the immensity of this question, the fallacy behind it, and the overwhelming likelihood of falling into stereotypes when answering. And yet not to reply would have been rude....So I answered him: I told him that Koreans like to dance.…And here let me explain more fully what I meant. Dance is a physical allegory of our emotions....I told the journalist that Koreans like to dance because I wanted him to understand that a Korean cannot always say what she means and she cannot always sit still until she is told she can move.” She was alluding to a story she had told at the start of the talk, about growing up as a troubled student in Korea with a tendency to daydream (she was considered “slow” or “odd”). One day when she was six, she got up to pace in the back of the classroom; her teacher called her to the front and struck her hands with a ruler. Her mother wasn’t angry with her. She picked her up early and took her to a café, calmly telling her to get out of her seat only when the teacher tells her to.